Here, it's all concrete - walls and floors. We never get to see outside, the sun, grass or anything. 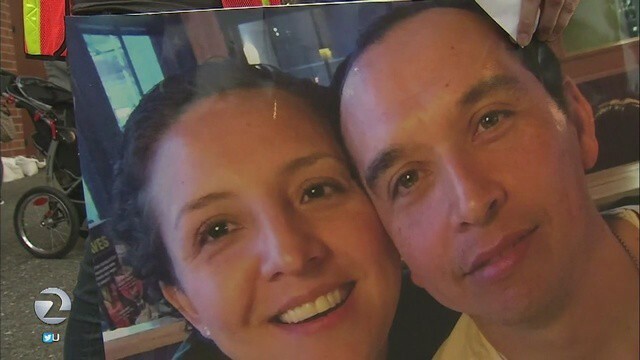 Thirty-seven year-old Hugo Mejia, a father of three from San Rafael, CA, was detained at Rio Consumnes Correctional Center in Elk Grove for six months. My name is Hugo Mejia and I was picked up by ICE on May 3rd while reporting to work. I thought it would be just another construction job for my co-worker, Rodrigo, and me. We arrived at Travis Air Force Base early, a little after six in the morning, and were sent to the visitor center to get a badge and a work permit. A military officer there did a background check on us. Then he gave us a form to fill out. It had a line for our Social Security numbers, and I had to leave it blank. The officer asked me why — and I told the truth, that I didn’t have one, but that I did have a government ID I use to pay taxes and so on. But he knew we were immigrants; he called ICE — and told us they were coming for us. It was one of the worst moments of my life. All I could think about was my family, my wife. While we were waiting to be picked up by ICE, I phoned my wife and told her something was wrong, something was going to happen. She started crying — she wanted me to get away, to run — but of course I couldn’t. I told her I would call her later. She was still crying when we hung up. It took two hours for ICE to arrive. By then, we had been handcuffed, with chains around our waists to our wrists, and around our hips, too. They took us to the ICE office in Sacramento and asked questions about my family, about everything. They saw I had been issued a deportation letter in 2001, and told me I would be deported immediately. I asked about obtaining a bond, but they said that since I was deportable, I was not eligible for a bond, or a hearing by a judge. I was given a form to sign and told deportations took place on Tuesdays and Thursdays. It was a Wednesday. I signed the form because I didn’t think I had a choice. I cried, thinking I might be deported the very next day without being able to say goodbye to my family. In three hours my entire life had changed completely. I couldn’t imagine going back to Mexico and leaving my family behind. And I was scared: I come from a small town in Mexico. The drug cartels are everywhere — it’s dangerous. From Sacramento, I was taken to Marysville, to the Yuba County Jail. I stayed there until three in the morning, then was driven back to Sacramento. Rodrigo stayed in Marysville. One officer said my lawyer had called and told him I was going to fight my case. I wanted to know where I was going next, but they couldn’t tell me; it depended on where they had space. I waited in a room in the Sacramento ICE office for six or seven hours before being taken to the Rio Consumnes facility in Elk Grove. When we got there and I saw the fences and guards, I was so scared and confused that I started crying again. It was a prison, and I’d never in my life been in a prison before. I couldn’t understand what was happening to me. Every day here is the same. We have to get up for breakfast at four thirty in the morning. A few potatoes, eggs and two pieces of bread, plus milk and margarine. There is a loudspeaker with loud announcements starting at 5:00 a.m. and continuing all day long, so you can never sleep. Lunch is at 11:30 a.m., and is always soup, sometimes with something in it, and other times mostly just water. Then dinner is at 2:30 p.m. The best food is on Thursday nights at dinner when we get peanut butter and jelly sandwiches. From eleven in the morning to eleven in the evening we have access to phones and the TV. But lots of people play cards and dominos until late at night — and are so loud that you can hardly sleep at all before you have to get up again at four-thirty. Here, it’s all concrete — walls and floors. There are a couple skylights, but no windows. We never get to see outside, the sun, grass or anything. For one hour a day, we get to go to the “yard.” Except that it’s really just another room with bars and mesh across the top instead of a ceiling. There might be a basketball or a soccer ball inside. I never know what time we’ll go to the yard. It could be anytime; once, it was twelve-thirty at night. There are many people here, old and young, and sick ones, too. Generally, the guards are OK. When we make mistakes they don’t punish us, except maybe to turn off the phones or the TV for a while. I haven’t seen my wife in five months. My oldest son and my daughter visit me every few weeks. It’s a long trip: visiting hours are from 7:30 to 9 p.m., and Rio Consumnes is two hours from San Rafael, so they don’t get home until very late. I call my wife every night. Sometimes I’m able to talk to my children too, if they’re not asleep, maybe three or four times a week. The other day my youngest son, Angel, who’s ten years old, asked if I could pick him up from his first day at school. It made me cry to say no. When he asks when I’m coming home, I say, “I’m working. Maybe just a few more days.” Angel turned ten last month. I missed his birthday, and his First Communion on May 20th. My wife’s birthday was May 24th. And my eighteenth wedding anniversary was October 8th. Being here is costing my family a lot. Just to talk to them is twenty-one cents a minute. Because the food is so bad, my wife pays $38 a week for an “I Care Package,” a small box containing crackers, instant soup, tuna, and cookies. In total, my family spends $100 or more a week to meet my basic needs: food, phone calls, stamps and paper, which means that in the last five months, they’ve spent $2,000 on my detainment. I feel terrible that because I am here, I can’t do anything to help pay for these costs. I have a lawyer, but I don’t have a court date for a bond hearing. I have to be here for 180 days before they’ll set a date, and even then, I’ll probably have to wait another couple of weeks before I can see a judge. I’m so grateful for all the support I’ve received, particularly from my community, the Venetia Valley Family Center, Congregation Rodef Shalom, Representative Jared Huffman, the schools, and my union. I’ve received many calls and letters, even from people I don’t know. I’ve given interviews, to ABC, CBS, Telemundo and Univision and others. I never thought I’d receive this kind of support — but then I never, ever thought I’d find myself here. I want people to know we are good people. When I came to this country, I was twenty — and I followed all the rules. I paid my taxes and worked hard to support my family. I am a good father and member of the community. We just want to build a better future here for our children and ourselves. I’ve lived in the US for seventeen years with a clean record. And I’m not special: there are millions like me out there, all trying to do the right thing. But people like us are powerless to fix our status. I worry every day what tomorrow will bring. But only God knows what will happen. UPDATE: Hugo was released right before Thanksgiving!